← This year’s Lit Fest: Plan ahead! Just discovered a new author! So happy. She has a backlist I haven’t read, so off to the library for me. 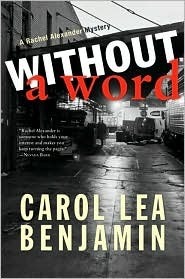 The author is Carol Lea Benjamin, and the book I recently finished is Without A Word, featuring private investigator Rachel Alexander and her pit bull, Dashiell. In my quest to find a picture of the cover for this blog, I discovered that Benjamin is a dog trainer in real life. She even blogs about dogs on WordPress. And there are evidently TWO covers – the gritty city street one that attracted me, and one which fits her “dog-themed” positioning. I gotta tell you, I’m not sure I would have plucked this mystery off the shelf with the dog cover, particularly if they were all lined up. I’m not a giant fan of cozies with cats, coffee shops, bakeries, and the like, and the various dogs on the various covers might have put me off. That would have been my loss, because Benjamin’s a good story-teller, her characters are interesting (although not always likable), and in this particular book, while there is not quite enough urgency around the fact that an 11-year old girl is about to be charged with murder, the relationships and the sleuthing are compelling enough to make me go looking for more. The story starts at NYC’s Washington Square Park dog park (I think I’ve been there!) where a man asks Rachel to find his missing wife. Why? Their daughter – who has some kind of neurological disease that results in tics and trembling – hasn’t spoken since a couple of days after her mother’s disappearance. Which would be bad enough, but now she’s suspected of killing her pediatric neurologist with a syringe of Botox. The story goes in various directions, but the most satisfying is Rachel’s growing relationship with the child who has no reason to trust anyone, but starts to trust Rachel anyway. Rachel solves the doctor’s murder (and if I hadn’t been so caught up in the story, I might have figured out who did it by using the “who doesn’t have a real reason to be in this story?” rule of thumb) and finds the mom, but the two plot threads turn out to be not-so-connected after all. Reading her blog, it appears that there may be one sad note to my discovery of the Rachel Alexander series… it appears she’s been dropped by her publisher, so no more new ones. Knowing from other authors how difficult it is to find a new publisher in this situation, let me just say two words: Amazon. Kindle. This entry was posted in Commentary and tagged Carol Lea Benjamin, Rachel Alexander mystery, Review, Without a Word. Bookmark the permalink.